OK remember there will be a test. 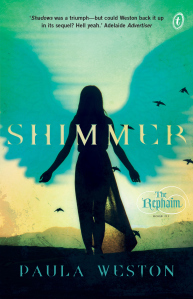 Read Shimmer, see if you can remember all the characters names, and who does what to whom, and why? Leading on from Shadows and Haze, we have the third book by Paula Weston in what looks to be a saga of angels and demons. First you have the Rephaim and the main protagonist Gaby/Gabe and her brother Jude, and both of them had their memories wiped a year ago, so they only recently discovered they are not hot young adults but somewhere in the region of 125 years old and not exactly human. (But still pretty hot) Add Rafa, who Gabe lusts after, but who is unfortunately indisposed, as he has a sword in his guts (put there by the demon Zarael) and Jason, a kind of Australian angel geek who has a mysterious background with the family who built a trap to catch the fallen. Add Daniel, one of the Council of Five who runs the Sanctuary (and was Gabe’s former lover)- where it is supposedly safe from demons. Now add Taya, Malachi, Daisy, Calista, Uriel and Magda who are all good with a sword and an argument. Then there are the outcasts Mya, Ez, Zak, Jones and Seth – er who are also great with violence and swords and just might not be as trustworthy as they make out. Then there are the odd humans from Auatralia in all this who are handy with self-propelled rocket launchers and then to cap it all off – there are the demons Zarael, Bel and Leon. I almost forgot the monks – don’t forget the monks, such as Brother Stephen, who is a tad shifty I reckon. Leader of the pack is Nathaniel – a real angel with a direct line to heaven whose job it is to protect these ‘kids’ as they search for the Fallen who are to be punished for all their transgressions. Yes it’s a little crazy – there are way too many characters and pretty much all they do is bicker and stab each other and fight with swords (mostly for fun) and if they get injured they ‘shift’, that’s teleport to you and me, and somehow this ‘heals’ all wounds’ although I am not clear as to why. This is all started back in Pan Beach, Australia when Gaby discovers that she is the daughter of a fallen angel as is her twin brother Jude– who was missing – supposedly travelling. They had memory implants that made them think they were backpackers and so, once convinced they were ‘different’, they had to relearn all their skills as Rephaim all over again. Gaby/Gabe had a bad rep in her previous incarnation so she invites quite a reaction whenever she turns up places, but she has a good heart and is very brave, even when faces with crazed beasts in a cage. You don’t really need to know much more. Just pick up your sword and hack away – that’s what Shimmer is good at. They have to rescue Rafa and Taya from the Iron Room, but true to form there is a lot of bickering and posturing to be done first. During the 125 years of their existence – they haven’t really learned much about maturity – so think glossy teens with swords, zero attention spans and shifting superpowers and you have it in one. Action, blood, demons, betrayal and endless battles Shimmer has it all… just as long as you know who is who and what side you are on you will be fine.